Kottos points out that there are a lot of physics applications that require use of a compact laser system that also has high-output power requirements. To fulfill this need, many physicists have taken to combining multiple lasers into an array. Unfortunately, this approach suffers from the production of a lesser-quality beam. Kottos notes that one way to overcome this problem is to use selective amplification of a single mode—but doing so has its own drawbacks. In this new effort, the researchers have come up with a different approach—one based on the principles of supersymmetry. Supersymmetry is a math-based theory that describes the relationship between bosons and fermions—it suggests that for every known elementary particle, there has to be a much heavier "super partner." 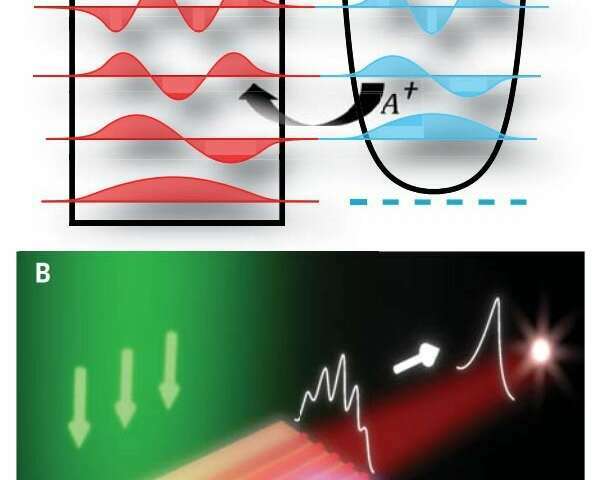 To build a new kind of laser system, the researchers used this idea to create a stable array of semiconductor lasers that together offer the power needed for prospective applications. More specifically, they designed a system that emphasizes the fundamental mode by suppressing higher-order modes. They did this by pairing them with low-quality modes—their lossy super-partners. The idea was for the array to support them such that they were phase-matched with the higher order modes. To test their ideas, the researchers built a system by first creating multiple quantum wells on a tiny (just 1000 nanometers wide) indium phosphide wafer—each of which was just 400 nanometers apart. They stimulated the structure by firing a 1,064 nanometer wavelength laser at it. Doing so suppressed the higher-order transverse modes while exhibiting low divergence. They report the fundamental mode was decoupled from the lossy section and that it was the only one that experienced gain—and that led to single mode lasing.